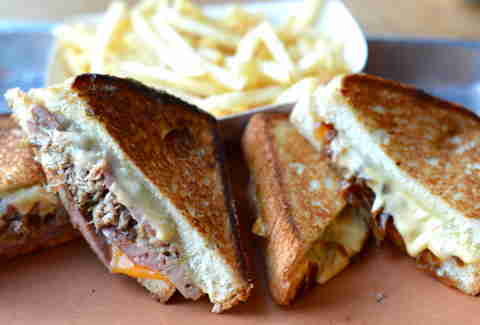 Wait, this place has upscale nautical decor AND an elegant, ocean-centric take on the humble grilled cheese sandwich??? True story, this borderline genius version was created as a more affordable alternative to the lobster sliders, and keeps things simple with just three ingredients: an entire (!?!) 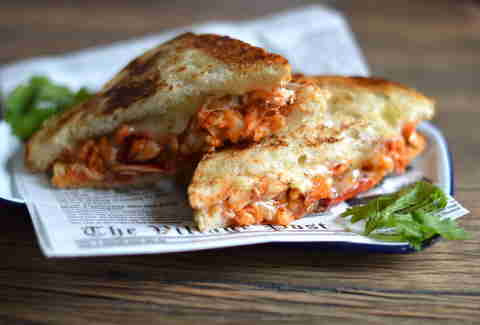 Maine lobster, white cheddar, and red chili flakes. The veteran of the bunch, they've got a new third location with three additions unique to the shop, including the Grilled Chicken, an oozy wonder with hearty portions of perfectly cooked poultry, plenty of havarti, roasted tomatoes, and truffled mayo on slices of nutty multigrain bread. What's best about this East Village throwback luncheonette is you can mix and match breads and cheeses with additional toppings for customizable sandwiches. 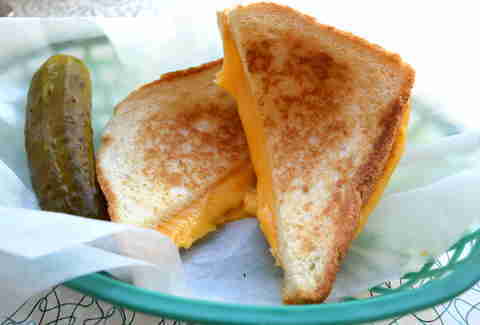 Even knowing all that though, you should still go with the classic-est of classics: slices of American cheese melted between buttery white bread. The only three words you need to know when you hit this cozy Park Slope restaurant? The Valley Thunder. 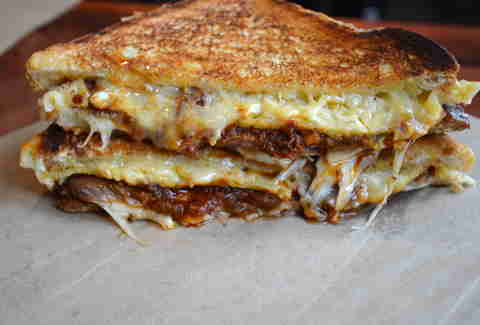 The sandwich marries 12 month-aged cheddar with thinly sliced and insanely tender brisket, plus a heaping layer of mac and cheese, all slapped between two slices of bread and grilled to greasy perfection. While the double hit of cheese (all sourced from the Valley Shepherd creamery) is definitely delicious, it's the rich tomato sauce that coats the brisket that makes this thing next-level. 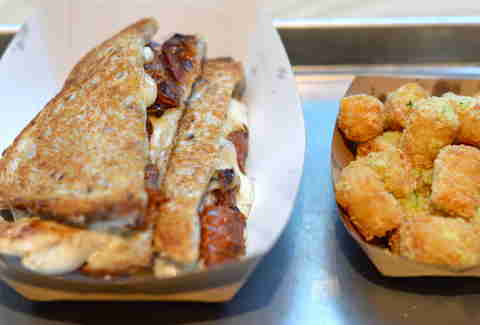 Just a stone's throw away from the Barclay's Center, this Texas-touting BBQ joint is now home to the "Thrill Cheese", an off-menu GC created specially for Thrillist readers (that's you!) with tender pulled pork and housemade pork sausages made by Pit -master John Avila (from meat mecca Salt Lick in Austin), plus white cheddar, yellow cheddar, and a smoked queso laced with poblano peppers. 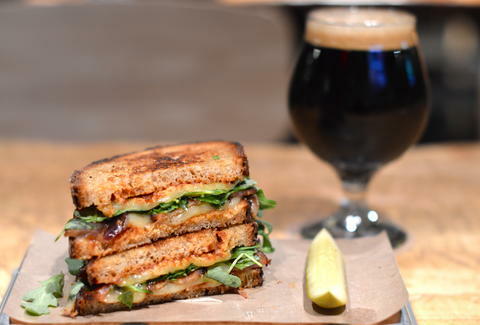 Inspired by the flavors of a BLT, Chef Dan Rothman crafted a grilled cheese that holds up to hours of craft beer drinking on the Gowanus outpost's rooftop bar and restaurant. 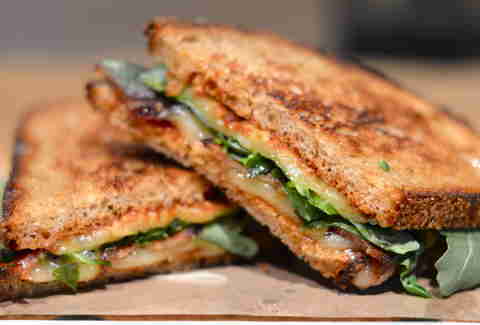 In this case, the B is a thick cut maple-cured bacon, the L is baby (L)arugula, and -- since tomatoes are more frequently out of season -- the T's a spicy and sweet tomato jam made with stout and spread on slices of Orwasher's levain with plenty of aged gouda. Two Midwest natives opened this West Village joint as an altar to two staples of Wisconsin culture --grilled cheese and ruining everyone's March Madness brackets frozen custard. Aptly named the 4:21, this gut-boaster loads a savory French Toast brioche with smoked gouda, a massive fried egg, crunchy French onion chips, and a slather of ranch dressing. Classily dubbed the Toasted British Cheese Sandwich, the grilled c at Murray Hill's latest English import gives any buttery, crispy, melty sammie a run for its money. 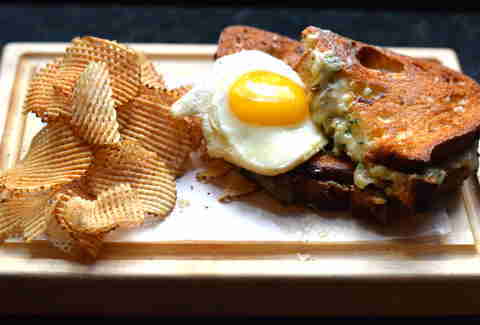 Chef Robert Atkins melts pungent Stilton with sharp cheddar from his motherland with mild spring onions, and then serves the sandwich with a fork and knife to cut through the fried egg on top. 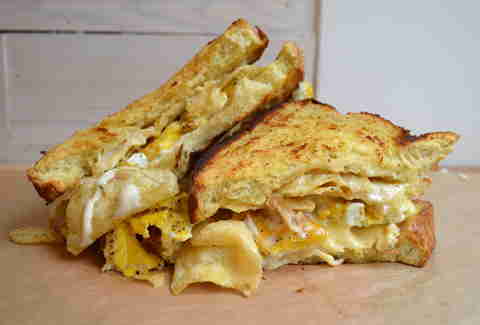 Oh yeah, there's a fried egg on top.